The 2019 Outdoor track season doesn't kick off for almost another 4 months, but that doesn't mean we can't start getting in the mood now! The majority of the indoor season for Indiana doesn't tend to start gaining lots of traction until February either. To kick things off, let's take a peek at the top teams in the state based on their team from last season and a few of their incoming freshman. 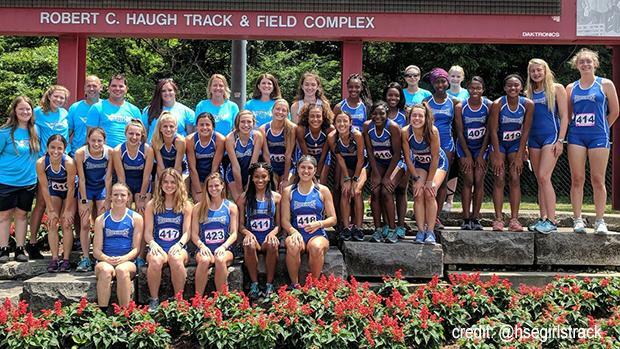 The defending champs, the Royals of Hamilton Southeastern, return most of their squad from the last year with only two notable losses coming from their sprint side of things with Camille Christopher and Mia Mackenzie graduating. The Royals also lost their #2 pole vaulter, Jessica Bray to graduation as well. Christopher managed to score the most points out of any individual athlete in the meet between the 100,200 and the 4x1. Her shoes will be tough to fill on this squad, but they earned enough of those little points last year as well to help keep them afloat this year. Having the defending pole vault champ, Kennedy Drish back helps greatly as she should be a good pick for a top finish. The 4x400 relay can be an event to make or break a championship, but thankfully for this squad, all four girls return this year and should be just as good if not better. The Lady Warriors of Warren Central. Last year the Warriors had what seemed like a secret weapon in Prommyse Hoosier, this year she is anything but a secret, coming into the season as the US #2 returner. She will be a big power for the team as she should easily score 10 pts in the long jump for them. She also has the ability to make it to finals in the 100 dash as well, providing at least an extra point or two for the team. The teams other not so secret weapon comes with sprinter Mikeisha Covington who has the ability to make finals in all 3 sprint events. And as we know, making finals guarantees you at least 1 point for your team. Last year she won the 400, 3rd in the 200 and 5th in the 100. Other than these two ladies, the Warriors will need some other athletes to step up this season to make that jump to a top finish. They have a fully returning 4x4 team, that placed 6th last year, that should hopefully improve this year. The Panthers of North Central. This is definitely a team to not forget about this year, despite taking 7th at last year's state meet. This is a team that could surely prove that even the little points matter when it comes to winning a state title. They return all 4 of their girls from the 25th place 4x800 team, only 6 other teams ahead of them can claim that as well. Now being a returner like that, does not hold much weight in the grand scheme of things, but the odds are usually that they should all improve and make the squad better from last year. Still to get up in the range of the top teams, they would need to drop roughly 10 seconds from each leg, or 40 seconds from the total time of last year's state performance. Their 4x400 squad is in good shape, returning all 4 girls and coming off a 4th place finish at last year's meet. They were within 2 seconds of taking first. Their 4x100 team is also in good shape, coming off a 3rd place state meet, within .6 of taking first. They do loose their anchor with the graduation of Amaza Rudolph, but her spot does not look like a tough one to fill. The lady panthers will be adding one of the nations top sprint talents to their roster this fall with freshman Ramiah Elliott. She comes in with massive times already of 12.08, 23.84 and 54.27 in the 100, 200 and 400 respectively. Elliott should be an immediate scoring impact for North Central this spring. This team should have little problem improving on that 7th place state finish. Last year's runner-up squad looks to be one of the best coming into this year. This could be the year that North Central has teams that both are top quality groups all season. Their relays tend to put together good groups for state each year. The 4x8 crew only returns 1 guy from last years state group, so they have some refilling to do up there to find some quick 800m guys to start the meet off right. Same goes for their finishing relay, the 4x4 crew. Last years group was just a second away from grabbing the win, so to keep that rolling they will need some of their sprinters to make a good jump to fill those spots as well. Their big power comes from easily the tallest guy on the team, Ethan Alyea. He comes in as the top returner in the discus and the #2 returner in the shot. He looks to be the guy that will grab them a lot of points, with the potential to get 20pts for the panthers. Getting at least one sprinter into the finals of any of their events could be helpful as well, as that is a guaranteed 1 point for them as well. The Red Devils of Pike seem to always bring their A-game in the sprints come state. This year should be like no other with Jahn Riley leading the way, as the top returner in the 200. He missed out on finals for the 100 last year but could very well make it there this year. Someone who seemed to quickly get over shadowed at last year's meet in the high jump, Lawrence Mitchell looks to be the man to beat now. He went back and forth with Patterson for a little bit last year, topping out just below 7ft. This looks to be his year to break that mark as well. They also had a freshman, Zavier Simpson attempt the high jump at state, but topped out at 6'4" for 14th. If Simpson takes some good pointers from Mitchell, he could very well score for the Red Devils come June. On the distance side, JT Hodges may also be able to put something together and grab a top finish in the 3200, as he is the #6 returner from last year. Their 4x100 team looses some big power with the graduation of Black and Glenn, but should be able to reload and keep up with a top 5 finish. Same goes for their 4x400 squad, as long as they can remain eligible for that fast heat they should be golden to grab some easy final points. The Irish of Cathedral have an interesting path to a top team finish at state this year. Their only relay at last years finals, the 4x8, needs to reload with at least one more strong runner to fill Morris Kimble's spot. The good thing is after this past cross season, they may have a couple different options of who to put in that spot to help improve off last year's 7th place. Then the real challenge comes in with distance stud, Cole Hocker. Which events do they put him in that would be the most beneficial to the team and not risk burning him out with too many events. Based on his PR's from last spring, he has the potential to win both the 1600 and 3200, as well as either win or take 2nd in the 800. That could mean an upwards of 30 points scored by one distance athlete. The distance triple has never even been attempted in Indiana history, let alone won all in the same year. Even if he just medaled in all 3, that would be insane to see happen. We don't fully believe right now, that his coaches will have him attempt all 3 for the tournament but we should see him double and potentially go for 20 points. He could even be a strong factor for their 4x800 team if they needed someone else. The Tigers of Fishers HS also have the ability to make some waves this spring. This is a team that has it together on the track, with some strong talent, but lacks on the field event side of things. But that doesn't mean they don't have the ability to win. Their 4x8 squad just needs to fill Sam Kuhn's spot from last year and potentially improve a little bit, as they took 9th last year to grab just 1 point. Their 4x4 group returns as the favorites, after winning by just .6 seconds last year. But then again, they lost 2 seniors so the hope is that there are some underclassmen that have been putting in the work and are ready to step into those shoes now. The 4x1 crew is in good position coming into the new year with a 4th place finish last year. Ethan Meyer is the #5 returner in the 1600, and after a great xc season, should hopefully be able to pull something together and make for a good final push. Meyer may also take a stab at the 800 and get some good speed in there on the double. HL Lewis will become a big factor in this teams success this year, as he will likely be in that 4x1 and 4x4 squad, as well as taking a stab at the 100 and 200 individually. Now he did not compete in the 200 at last year's state meet and he took 14th in the prelims for the 100. But improvement is the name of the game and coming off an ok football season we expect to see HL taking on both events at state this coming year.